The so-called ‘Roswell slides‘ have been exposed as having nothing to do with aliens and everything to do with the will to believe that underpins the UFO syndrome. What Nick Redfern calls ‘the biggest soap opera since Dallas‘ came crashing down less than a week after the slides were first exhibited at a ticket-only, pay-per-view event in Mexico City on 5 May. Research by a crack team of skeptics has established beyond reasonable doubt that the ‘alien’ inside the glass case is in fact the mummy of a child who was born and died on this planet. As I pointed out at the time 5 May 2015 is exactly twenty years since the fake alien autopsy film was unveiled in London. That was also supposed to show images of aliens recovered from a flying saucer that crashed near Roswell, New Mexico, in 1947. But the links between the slides exhibited in Mexico City and Roswell were even more tenuous than those claimed for the alien autopsy footage. 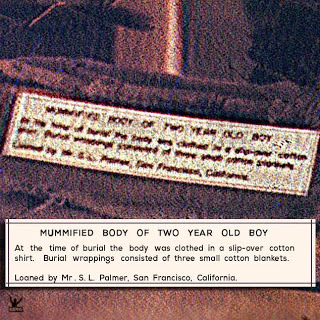 Even before access to high resolution images of the slides was obtained, skeptics had drawn comparisons between the body shown and a child’s mummy. But the coup de grace was delivered by the Roswell Slides Research Group that was formed to critically evaluate claims that were being made about the significance of the images on the slides. One of the group used a piece of commercially-available software to clean up the blurry text that was visible on the museum label visible beside the glass case in which the mummy was exhibited. “…various other researchers have now duplicated and accepted those results. Most members of the UFO community have now moved on to ask how the text was not clear to the promoters of the slides before a big show was held in Mexico and whether the actions of those few individuals will do lasting damage to the wider field of UFO research’. This entry was posted in Uncategorized and tagged alien autopsy, Mexico City, Nick Redfern, Roswell, Roswell slides, Roswell Slides Research Group. Bookmark the permalink.